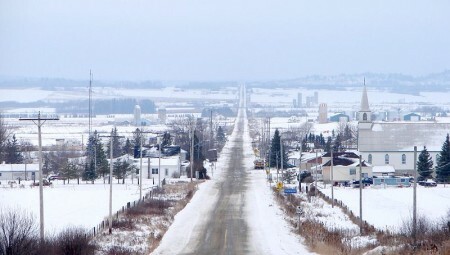 Thornloe is a largely francophone hamlet on Highway 11 that is famous for cheese. Its cheese is relatively cheap, well made, and is particularly known for its cheddar and hot pepper colby, as well as its curds. 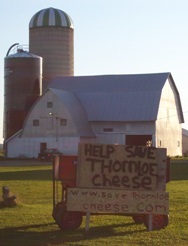 It has been known for people to travel from North Bay, and Timmins, and beyond just for Thornloe cheese. The Thornloe Cheese Factory is so popular that the Ministry of Transportation gave the factory its own turning lane on Highway 11 for safety’s sake. In July 2006, Parmalat International announced that it was going to shut down the cheese plant. This started a storm of anti-Parmalat sentiment in the area, and residents (battle-ready from Adams Mine and Bennett Incinerator fights) were mobilizing quickly. I was in the area at that time – it was a really big deal. I’ve been back since, and it seems they’ve done some renovations. There is a new sign, the cheese has neat new Thornloe-specific packaging – it’s all pretty well done. The cheese was good too – my partner and I devoured some curds, making sure to save some for the next day. Twenty kilometres north of New Liskeard, Thornloe is a tiny quiet strip of farms with a population of about 120. Established in 1916, Thornloe is about five minutes west of Highway 11 and always smells like a fall fair. There is a gas station right on the highway. There is a playground, an outdoor ice rink, and two churches in town (one of which is for sale.) There is a pioneer cemetery that I didn’t have a chance to stop at. Thornloe is cute, but there’s really nothing to see other than the nice green hills and the acres and acres of farms. I saw a wonderful orange sunset in Thornloe. The Temiskaming Farm Belt may not be exciting, but if you like rural farm country then it sure is beautiful. 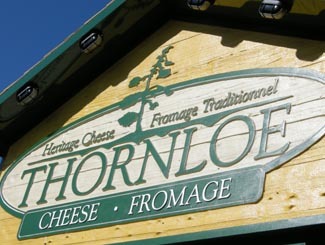 Note that the Thornloe Cheese Factory is often closed after six pm, depending on the season. This entry was posted in Temiskaming and tagged farm town, francophone by Highway11.ca Editor. Bookmark the permalink. Se a Igreja de Thornloe estava à venda em 2006, não sei. Igreja à venda?. Sei que em final de 2009 a Igreja continuava lá, talvez sem ser usada. Deu para ver a escada de acesso faltando limpeza. No geral não há sinais de abandono. I just bought Some old thornloe cheddar at a butcher shop on manitoulin, excellent, I have,nt had cheese like that since the old general store in oxenden back in the forties and early fifties, where can I get it in south Georgian bay? +My fathers from Hilardton and when every we go up we have to stop at the cheese factory,to get cheder cheese with garlic. No other place make quite right. tHORNLOE IS A FANTASTIC PLACE TO VISIT, IT IS BREATH TAKING, AND YOU HAVE TO STOP IN AND TRY THERE CHEESE ALMOST EVERY KIND. EVERY YEAR WE GO UP THERE WE HAVE TO STOP IN AND GET SOME CHEESE TO BRING HOME , IF IT MAKES IT HOME. Thornloe Cheese is open later then 6, depending on the day of the week and the season!